Tamarack’s Summit chair takes you 2,800 feet above the base. It was just a few short years back that Tamarck Resort in central Idaho was on track to be one of the premier four-season destination resorts in North America. It was pretty easy to understand why, with an impressive ski hill, award-winning golf course and quality homes and lodging already built, they were on their way. As Tamarack was tackling its next phase, and construction crews were going full bore building the resort village in 2008, that all came to a screeching halt. With a huge downswing in the economy and a nationwide decline in real estate sales, Tamarack’s majority owners were sent into a tailspin, filing for Chapter 11 bankruptcy. The close knit community of Tamarack homeowners did not take this lightly, and in 2010 formed their own alliance, the Tamarack Municipal Association, which is now running the once defunct resort after a challenging start. The association is not only surviving but blossoming. Tamarack Director of Marketing Wolfe Ashcraft gives the association kudos for pulling the resort back from the brink. “The ability for a small group of homeowners to successfully maintain and operate the resort … suggests that Tamarack is a viable product and fills a niche in our region for an accessible, affordable, modern resort,” Ashcraft says. Tamarack’s second coming has been aided by its geography, as well. 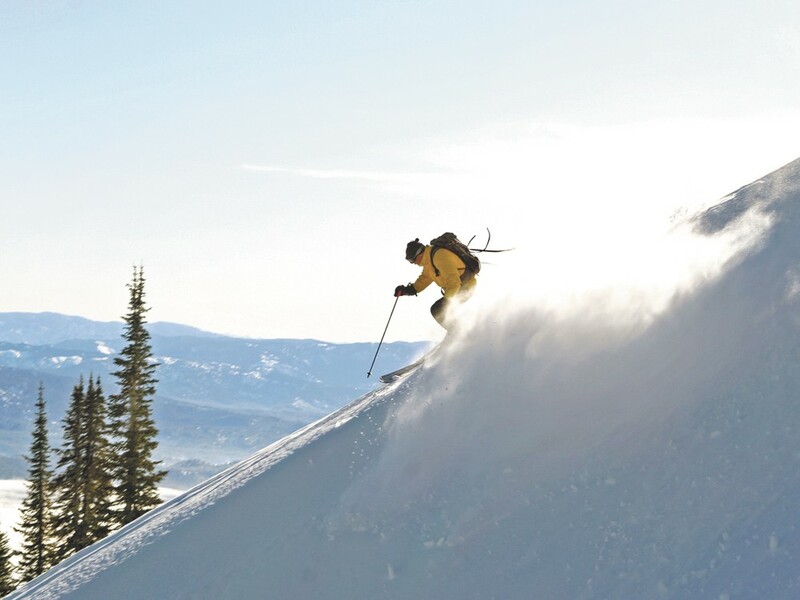 Located just a short half-hour drive south of McCall, Idaho, it draws skiers and boarders from Boise, and — open four days a week, Thursday through Sunday — it’s a manageable weekend getaway from the Spokane/Coeur d’Alene area. Nestled in the Payette Mountain Range, Tamarack Resorts’ 32 runs and six lifts are positioned on a long running north-south ridge overlooking Cascade Lake. With first rate grooming and powder stashes throughout the property, you’ll have plenty of choices for all levels of riders as Tamarck’s terrain is rated at 15 percent novice, 56 percent intermediate and 29 percent advanced. If you want to get those legs burning, I suggest hitting the the Summit chair, a high-speed quad which will drop you off at the 7,700-foot summit. Tamarack’s base area sits at 4,900 feet, so from top to bottom you are in for one rip roaring, 2,800-foot vertical descent. For backcountry enthusiasts, it’s a relatively short hike or skin off the Summit chair for an incredible sidecountry experience. If you’re not quite that adventurous, but still want to take full advantage of Tamarack’s 300 inches of annual snowfall, there’s plenty of tree skiing through many of the tamarack and aspen groves peppered across the mountain. I was fortunate enough to tag along for some eye opening powder runs with longtime local like Dave Williams. This man knows Tamarack and its backcountry inside and out. For the adventurous and high flying there are two terrain parks set up on the mountain. The No Business terrain park has plenty of features that will keep challenging even the highest level of riders. For those just cutting their teeth on the T-Park scene, there’s the Disco Terrain Park where you can strengthen your skills and ready yourself for the next step up. The base area hosts the snowsports school, Canoe Grill and the Seven Devils Pub, which are always favorite gathering places to unwind at the end of the day and talk about the day’s adventure with friends. Seven Devils offers a wide choice of bar menu, beers and well drinks. There’s also some good local food in the nearby town of Donnelly. The Donnelly Club and Dave and Kathy’s Double Eagle are always serving up good hearty pub food. For your pizza fix there’s also Main Street Pizza. As I mentioned, Tamarack was on track to rival some of North America’s premier ski properties, like Vail, Aspen and Sun Valley just to name a few, so with that mindset Tamarack has plenty of high quality, affordable lodging options. Whether you’re looking to rent a large estate home for several families or a cozy ski chalet, you have plenty of choices — including numerous condo-style residences at The Lodge at Osprey Meadows. This state-of-the-art condo complex has unique mountain flair with a generous use of native stone and timbered beams, giving each unit a warm, natural feel. The lodge overlooks the 18-hole Osprey Meadows golf course, which was designed by Robert Trent Jones Jr. In the winter, this award winning golf course doubles as a Nordic and snowshoe center which has a 20-kilometer groomed XC trail system that winds through open meadows and aspen groves.